What this language means is that if you and the company have a dispute, you both agree that you won’t take it to court, but will instead hire a “neutral” “arbitrator” to resolve the issue. The arbitrator can award any amount of money he or she sees fit, based upon the contract and the law. Your right to proceed class action is cancelled. A “class action” is a lawsuit where lots of people claim that a company wronged them in the same way. Generally, it is for small amounts (maybe only a few dollars) that wouldn’t make sense for 1 person to waste their time going to court for, but if there are 10,000 people just like you and you can all sue in one joint lawsuit, the company can be held accountable. You generally can’t “contract away” the right to proceed as a class under most states’ laws, but by requiring arbitration, the Federal Arbitration Act (FAA) takes over the terms of dispute resolution, and the FAA allows for class rights to be signed away. You should therefore take an arbitration clause as a sign that the company is afraid that it has, or may, piss off a large consumer base, and wants to protect itself from any damages that can come from that. It’s a bad sign. Your right to an appeal is cancelled. An arbitrator’s award, in general, cannot be appealed. Did your arbitrator turn out to be biased, or literally fall asleep during proceedings? Too bad, according to the FAA. With exceptions too narrow to be worth pursuing, a court cannot overturn an arbitrator’s award, no matter how unfair. No case law is created. “Case law” is the decisions of courts in the past that influence decisions of courts in the future. For courts of the same jurisdiction and same level or lower, a decision on an issue is usually binding. For example, if the U.S. Supreme Court decides that TSA body scanners are unconstitutional and Plaintiff X, who was forced to go through one, gets $100 in damages, every other court in the country must follow suit and award similar damages to anyone who presents a similar case. When an arbitrator makes a ruling, it may or may not be public, but either way, it is binding on no one. Therefore, if the company has wronged 10 people in the same way, but has an arbitration agreement, even if the 1st to arbitrate wins, people 2 – 10 still need to argue the issue anew. Oh, you thought the arbitrator was neutral? There’s a pretty big conflict of interest here. The companies are the ones including arbitration agreements in their contracts and sending work to the arbitrators. If one of the two parties sends all the work and the other does not, where does loyalty lie? Even if an individual arbitrator is conscientious enough to remain neutral, what effect does the conflict of interest have on the rules that the arbitrator has to follow? For balance, I’ll note that arbitration can have some benefits for the consumer. For example, if the claim is for a large amount of money, it will be a shorter “trial,” and therefore you’ll be paying your attorneys less money. Arbitrators are also more likely to award attorney’s fees to you if you win. Also, in non-consumer contracts, you may sometime have an edge. A friend of mine involved in an employment contract dispute against a major corporation recently lamented to me that the attorney’s fees to take the major corporation — which could afford to prolong litigation to gain an advantage — may be unsustainable, forcing this friend to consider settlements beneath what his or her claim was worth. But in consumer contracts, the overall balance is clearly in favor of the company (which, of course, is why they put the clause in there in the first place). But what can you really do about it? Well, to start, many arbitration clauses have an “opt-out” option, whereby you notify the company that you disagree, and the clause no longer applies. If this is an option in your contract, follow the instructions carefully to make an effective opt-out (before the TSA bans those opt-outs too :)). If it doesn’t, you can try negotiating the contract, even if the company is large. If it’s a paper contract, you may “negotiate” simply by crossing out the provision and initialing the change before signing. You’d be shocked as to how many times I’ve crossed out arbitration agreements and simply said, “I don’t arbitrate,” and they’ve said “Um, ok I guess.” If all else fails, tell them you’re heading to a competitor. Lost sales are, in the end, the greatest motivator to companies to create fair agreements with their customers. I wish I were writing this week about how the TSA misses 95% of weapons when screeners are covertly tested, how they “reassigned” the TSA acting director as a result, or how the TSA hired people on its own terror watch list as screeners. But since apparently no one actually is targeting our skies anymore (as clearly the TSA is not stopping anyone), the TSA is now merely a joke. What’s not a joke is that a 22-year-old man is dead in New York, a suicide spurred by a systematic violation of his rights by the courts, “New York’s Boldest” (The NYC Department of Corrections), and the Bronx District Attorney’s Office. Kalief Browder was arrested when he was just 16 years old, accused of stealing a backpack. He plead not guilty and asked for a speedy trial, but because of delays by the NYC DA’s office, he was held for 3 years without trial before a judge told the city they had to let him go. A total of 31 court dates were scheduled, most resulting in an adjournment at the DA’s office’s request. If that’s not bad enough, he experienced significant abuse and neglect on Rikers Island, the notorious NYC jail. Video taped beatings by guards, absurdly long stints in seclusion in solitary confinement, and abuse by his fellow inmates were this man’s life for more than 1,000 days without being convicted of a crime. While there is evidence that he may not have committed the crime in the first place, he likely would have served months — or less — had he merely plead guilty. Traumatized by his experience and struggling to integrate back into society after having those pivotal years taken from him, he took his own life last Saturday. What does it say about our justice system that asking for a trial can result in spending more time in jail than pleading guilty, even if the result of the trial is a not guilty finding? What kind of judge refuses to release this man on a reasonable bail (or on his own recognizance) once they realize, “Hey! He’s already been in jail longer than we’d keep him if he were tried and convicted? !” What kind of DA postpones a man’s fate dozens of times because he can’t manage to prepare for a simple trial over 36 months? And where did our constitutional right to a speedy trial go?? Consumer Finance Protection Bureau: Protecting Consumers or Banks? A bit off topic, but I just can’t resist blogging about any useless or counterproductive federal agency. A couple weeks ago, my gym membership dues hit one of my debit cards and overdrafted one of my checking accounts (the perils of having more than one account, it seems, is that occasionally one ends up empty… but I digress…). This shocked me, since federal rules that went into effect in 2010 bar debit overdrafting and associated fees without an explicit opt-in, which there’s not a chance I would give. I called my bank and asked if they enjoyed flouting federal rules, to which they replied that these rules only apply to “one-time” transactions and my gym membership doesn’t count. A quick review of the rules shows that they are correct that these rules apply only to “one-time” transactions, but there’s no definition of “one-time.” Debit card transactions aren’t “scheduled” with the banks or anything — merchants process them as agreed whenever they get around to it, so really, every transaction, in my opinion, is “one-time.” So where is the line drawn? If I go to a restaurant twice and use the same card, is that no longer one-time? Does it have to be on regular intervals or a specific number of instances? The agency responsible for the rule gets the first pass at defining the ambiguous (that is, courts give “deference” to an agency as to the interpretation of their own rules, so long as that interpretation isn’t absurd). 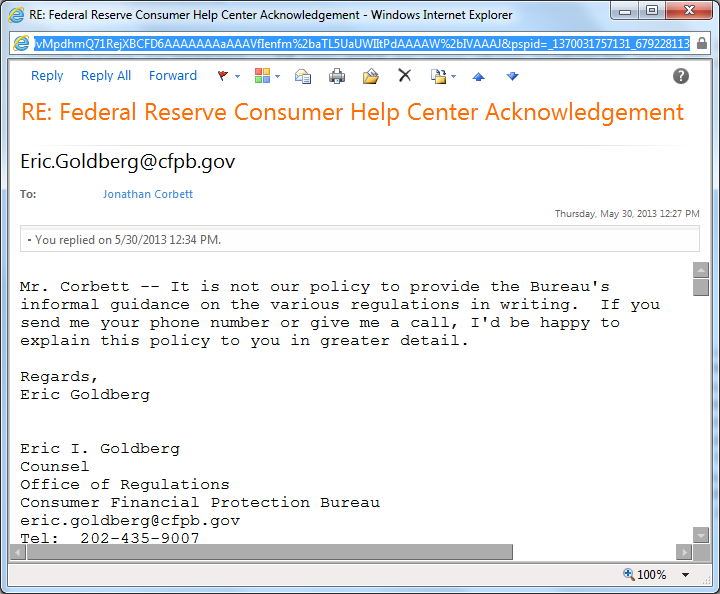 So I asked the agency responsbile for the rule: while original the rule was issued by the Federal Reserve, authority for the rule was passed on to the Consumer Finance Protection Bureau upon its creation in 2011. So I e-mailed the agency asking for their interpretation of “one-time,” and was surprised to get a fast response from an attorney for the agency who asked me to call him to discuss. I politely declined, explaining that I’d prefer it by e-mail such that I could forward a copy on to my bank if the interpretation was useful for the return of my $35 overdraft fee. Here’s where it gets weird (well, weirder than a government agency that’s actually responsive other than when they want your money): The CFPB attorney refused to tell me the agency’s interpretation in writing. At first I’m told that “informal” guidance can’t be given in writing, and upon asking how to get formal guidance, I was told that individuals can’t. So if consumers can’t get informal guidance in writing or formal guidance at all, who is this “Consumer” Finance “Protection” Bureau protecting? Is this another one of those, “we’ll protect the people by protecting the financial institutions” type things? Too big to fail, too big to jail, and too big to talk about in writing (unless, of course, they request it). Naturally, they picked the wrong person to refuse — I’ll be continuing my query via Freedom of Information Act requests until I have my answer. Stay tuned tomorrow for the start of our 30-part series, “No Surveillance State Month,” where daily for the month of June I’ll be posting ways to avoid invasion of your privacy in the digital age.